For other uses, see Public bank. The German banking system is structured in three different pillars, totally separated from each other. They typically differ in their legal form and the ownership. Private banks, represented by banks like Deutsche Bank or Commerzbank as listed companies, and Hauck & Aufhäuser or Bankhaus Lampe as less known private companies, are part of the first tier. The second tier is composed of co-operative banks like the numerous Volksbanken and Raiffeisenbanken. They are based on a member-structure where each member, independently from its capital share, has one vote. The third tier consists of public banks, which are a legally defined arm of the banking industry in Germany. They are further divided into two main groups. The German Savings Banks Finance Group (Sparkassen-Finanzgruppe) is the most numerous sub-sector with 431 savings banks using the Sparkasse brand, 8 Landesbanken including the DekaBank using separate brands and 10 real estate financing banks using the LBS brand. The Deutscher Sparkassen- und Giroverband (German Savings Banks Association, DSGV) represents the interests of the Sparkassen-Finanzgruppe on a national and international level concerning law and the financial services industry. It also coordinates, promotes and harmonises the interests of Sparkassen. Based on OECD studies, the German public banking system had a share of 40% of total banking assets in Germany. This shows the important and significant role of this group of banks in Germany. Public banks in Germany are financial institutes, typically held directly or indirectly by the public sector, e.g. the federal government, the states, administrative districts or cities. Not all companies are fully publicly owned. They can also be defined as public by providing services out of a public interest. The public banks are represented through the Association of German Public Sector Banks (Bundesverband Öffentlicher Banken Deutschlands, VÖB) as one of the leading associations in the German banking industry. The association counts 34 ordinary members, but to distinguish the different groups of public banks it is important to know, that the Landesbanken as part of the Sparkassen-Finanzgruppe described below, are also members of this association. The typical public bank acts as business development bank (Förderbank, Aufbaubank or Investitionsbank) or international project, infrastructure and export financing institution. Most known representatives of this group are the KfW-Group, the NRW.Bank in North Rhine-Westphalia, the LfA Förderbank Bayern in Bavaria and the L-Bank, Staatsbank für Baden-Württemberg in Baden-Wuerttemberg. Savings banks in German-speaking countries are called Sparkasse (pl: Sparkassen). They work as commercial banks in a decentralized structure. Each savings bank is independent, locally managed and concentrates its business activities on customers in the region it is situated in. In general, savings banks are not profit oriented. Shareholders of the savings banks are usually single cities or numerous cities in an administrative district. Some 6 savings banks (Bordesholmer Sparkasse AG, Spar- und Leihkasse zu Bredstedt AG, Sparkasse Bremen AG, Hamburger Sparkasse AG, Sparkasse zu Lübeck AG, Sparkasse Mittelholstein AG) are independent from municipalities; their association is the Verband der Deutschen Freien Öffentlichen Sparkassen. The total assets of the Sparkassen amount to about EUR1 trillion. The 431 savings banks operate a network of over 15,600 branches and offices and employ over 250,000 people. Savings banks are universal banks and provide the whole spectrum of banking services for private and commercial medium-sized customers. 50 million customers maintain business activities with savings banks. Although independent and regionally spread, the savings banks act as one unit under the brand Sparkasse with the famous logo and the well known red colour. Depending on the strength of the economy in their region, the sizes of savings banks differ extremely. While the Hamburger Sparkasse as biggest savings bank had total assets of EUR 37.7 billion and 5,500 employees in 2009, the smallest one (Stadtsparkasse Bad Sachsa) had only EUR 129.6 million assets and 45 employees. The German Savings Banks Association (Deutscher Sparkassen- und Giroverband) was founded in 1924 as umbrella organization to organize the decision-making processes, coordinate the strategy of the savings banks and represent its members political and regulatory interests on national and international level. The regional associations are statutory bodies, savings banks and their municipal holders (Gewährträger) are statutory members of. They are responsible for the coordination between savings banks in a region. They also act as auditors and operate regional savings banks academies for educational and training purposes. The Landesbanken are mostly owned by the regional savings banks through its regional association and the respective federal state. After several mergers and acquisitions, there are seven Landesbanken-Groups left: BayernLB, Norddeutsche Landesbank (Nord/LB), HSH Nordbank, Landesbank Baden-Württemberg (LBBW), Landesbank Berlin (LBB), Landesbank Hessen-Thuringen - Girozentrale (Helaba), WestLB. Bremer Landesbank Kreditanstalt Oldenburg - Girozentrale belongs with a share of 92.5% to the Nord/LB-Group. The rest is owned by the federal state of Bremen. The Sachsen LB and the Landesbank Rheinland-Pfalz (LRP) since April 2008 are subsidiaries of the Landesbank Baden-Württemberg (LBBW). Until 21.06.2010, the BayernLB was majority shareholder of the Landesbank Saar (SaarLB) with a share of 75.1%. Since June 2010, the Saarland has become shareholder with a stake of 35.2% and the BayernLB reduced its share to 49.9%. 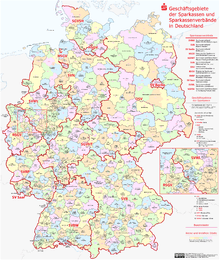 The remaining 14.9% are held by the Sparkassen through its regional confederation. The regional banks / clearing houses are the central banks of a savings bank association and act as the "main bank" of the states. They are also local banks, mortgage banks and general commercial banks. Their duties and power is codified in the individual country banking laws of the Länder (Landesbankengesetze). The specific tasks for the savings banks include the central clearing for cashless payments and liquidity funding for the regional savings banks. They also provide many services for the savings banks in the region in securities and cross-country businesses. In contrast to savings banks, they are doing "wholesale-banking" instead of retail-banking. With combined total assets of EUR 1,620 trillion as of December 2010, the 7 Landesbanken-Groups employ some 44,000 people. DekaBank with its subsidiaries is the central asset manager of the German Savings Bank Finance Group. Based in Frankfurt and Berlin it provides asset management services for the Sparkassen and the Landesbanken and their customers. With managed fund assets of about € 155 billion, approximately five million customer deposits and group locations in Luxembourg and Switzerland, the DekaBank Group is one of the largest asset managers in Germany. DekaBank's roots date back to the year 1918, when Deutsche Girozentrale (DGZ) was founded. Deka as an investment company was founded in 1956 (17.08.1956) by DGZ with a share of 23% in 11 other regional Landesbanken. Today's DekaBank was created in 1999 by a merger of DGZ and Deka. Until the 8 June 2011, DekaBank was owned by the German Savings Banks and Giro Association Landesbanken which grouped the shares in the GLB GmbH & Co.OHG, which held the DekaBank shares. On 7. April 2011, the Savings Banks bought the 50% stake from the landesbanken for a price of EUR 2.3 billion to become sole owner of the DekaBank. The acquisition was closed on the 8. June 2011 and DekaBank became fully, directly owned by the savings banks. 3,700 people throughout the group work in one of the 3 business divisions AMK (Asset Management Capital Markets), AMI (Asset Management Real Estate Business), C&M (Corporates and Markets), the sales division or one of the corporate centers. The Landesbausparkassen are subsidiaries of the Sparkassen and its associations and are regionally organised focussing on real estate banking. There are 10 Landesbausparkassen in Germany which employ around 8,900 people. Their combined balance sheet shows total assets of EUR 52 billion as per December 2009. Core business of the Landesbausparkassen is the offering of collective real estate saving products (Bausparen) and providing of low-interest residential mortgage loans. In addition to several banking units, the Sparkassen-Finanzgruppe also consists of 11 regional, public insurance groups, leasing and factoring companies, i.e. the Deutsche Leasing-Group, and numerous venture capital companies. ↑ Klaus Ulrich: Die deutsche Sparkassenorganisation, Deutscher Sparkassen Verlag GmbH, P.15/16. ↑ Magarete Wagner-Braun: Die Deutsche Girozentrale als Antwort auf Finanzprobleme des frühen 20. Jahrhunderts: in:Die DekaBank seit 1918, Publisher: Institut für bankhistorische Forschung e.V., ISBN 978-3-09-303815-0, P.16/17. ↑ Klaus Ulrich: Die deutsche Sparkassenorganisation, Deutscher Sparkassen Verlag GmbH, P.36-38. ↑ DekaBank Group Annual Report 2010, P.18. ↑ DekaBank Group Annual Report 2010, P.1. ↑ Magarete Wagner-Braun: Die Deutsche Girozentrale als Antwort auf Finanzprobleme des frühen 20. Jahrhunderts: in:Die DekaBank seit 1918, Publisher: Institut für bankhistorische Forschung e.V., ISBN 978-3-09-303815-0, P.28. ↑ Thorsten Beckers: Gründung und erste Jahre der Deutschen Kapitalanlagegesellschaft mbH 1956-1970 in:Die DekaBank seit 1918, Publisher: Institut für bankhistorische Forschung e.V., ISBN 978-3-09-303815-0, P.271. ↑ Chronik der DekaBank 1999-2007 in:Die DekaBank seit 1918, Publisher: Institut für bankhistorische Forschung e.V., ISBN 978-3-09-303815-0, P.463. ↑ DekaBank Group Annual Report 2010, P.19. ↑ DekaBank Group Annual Report, P.19-21.